There’s lots of big changes to talk about at Fraser Wood Elements! In addition to our newly remodeled, one-of-a-kind website, we are proud to announce that we are expanding! Fraser Wood Elements is relocating just a couple blocks away to 1023 Caroline Street. We’ll still be in the heart of downtown Fredericksburg, and the larger space will allow us to showcase more of our custom wood furniture, features, flooring and much, much more. 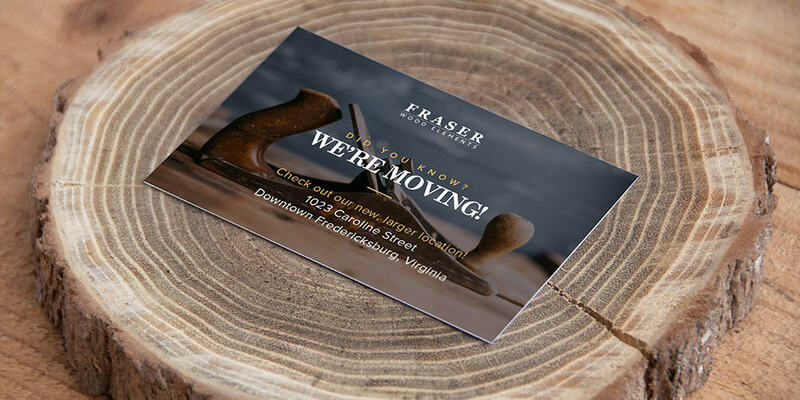 Since 2014, Fraser Wood Elements has occupied the small shop at 820 Caroline Street in downtown Fredericksburg. As our small business has grown larger over the years, our selection of wood products has gradually outpaced the space on our showroom floor. Moving into this larger, more accessible space will allow our customers to easily navigate the shop as they browse items, as well as more efficiently facilitate the delivery and pick-up of wood orders (through the rear of the building). Additionally, the wider store front provides great opportunity to showcase our newest custom wood products. This expansion is a great move for Fraser Wood Elements and our customers.